Abstract: Mitochondrial aldehyde dehydrogenase 2 (ALDH2) has been shown to protect against oxidative stress in multiple organs. 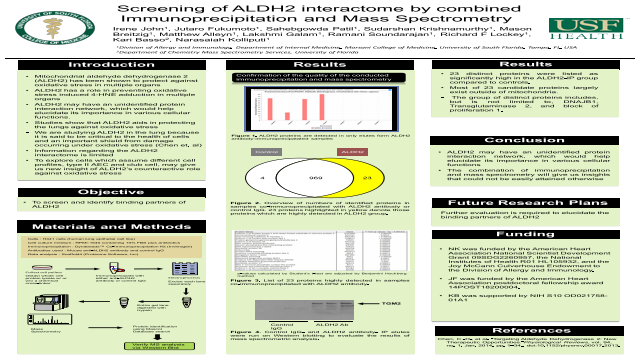 ALDH2 has a role in preventing oxidative stress-induced 4-HNE adduction in multiple organs. As a result, ALDH2 may have an unidentified protein interaction network, which would help elucidate its importance in various cellular functions. Studies show that ALDH2 aids in protecting the lungs against oxidative stress. We are studying ALDH2 in the lung because it has been demonstrated to be critical to the integrity of lung cells and an important shield from damage occurring under oxidative stress (Chen et. al).